ProScreen manufactures the 10 panel urine drug test cup featured here. It’s a one-step drug of abuse test for ten drugs with temperature and specimen test integrated into the specimen container. This test complies with NIDA and is CLIA Waived. This drug test kit is probably one of the most famous cup tests. 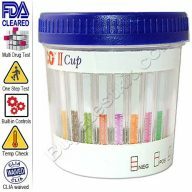 10 panel urine drug test cup is the perfect solution for testing employees in the workplace. Different from most designs, as the drug test and specimen test, are in the lid of the cup. This world-class professional CLIA Waived device detects a total of ten (10) illicit and prescription drugs in one test. It also includes specimen validity and urine temperature test and complies with all legislation for testing in the workplace. The cup is like a regular specimen cup; it has a thermal thermometer to monitor urine temperature. The lid attaches to the container to complete the test. 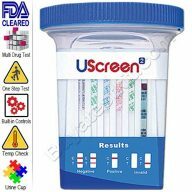 ProScreen are amongst the most reliable drug testing kits available, manufactured in the USA to the highest standard providing accurate and reliable results every time. They are FDA cleared and strictly adhere to cut-off levels set by NIDA. It is fully FDA 510(k) cleared and CLIA Waived for use in hospitals, at home and the workplace. Drug testing in health care facilities and other clinics. Hospitals, Medical Centers, Doctors Medical Center, Physicians. The Rolls Royce of drug tests! No collector exposure to urine. Packaged in 25 tests per box. Each cup has a temperature strip affixed to the side. Monitoring the temperature is a very important aspect of drug testing. If the temperature is out of range, it is generally an indication that the specimen is invalid or substituted. We recommend that the urine sample temperature is checked within one minute from the time of collection. The temperature range should be from 93° to 98°F . If the specimen is out of range, ask the donor to provide a new specimen using the same cup. 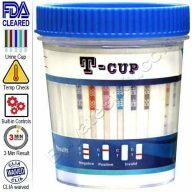 Using the 10 panel urine drug test cup is very simple. Remove the cup from its plastic wrapper. Hand the cup to the donor (person taking the test) and ask them to provide a urine sample directly into the cup to the mark on the side. Minimum of 40 mL. Remove the lid from the sealed foil wrapper, hand the lid to the donor and ask them to fix it securely. The apparent results will start to appear. The test is based on the color response of chemical indicators for the presence of adulterants. It is one of the most comprehensive tests available for determining the integrity of a urine sample. Ni level: Nitrite reacts with the reagent’s aromatic amine to form a diazonium salt which couples with an indicator to yield a pink-red/purple color complex. Urine samples containing nitrite at levels greater than 15 mg/dl are considered adulterated. pH level: Tests for the presence of acidic and alkaline adulterants. Normal urine pH ranges from 4.0 to 9.0. Values below pH 4.0 or above pH 9.0 are indicative of adulteration. S.G: Tests for sample dilution. Normal levels for specific gravity will range from 1.005-1.025. Specific gravity levels of less than 1.003 or higher than 1.030 is an indication of adulteration. The color changes from dark blue to blue-green in the urine of low ionic concentration to green and yellow-green in the urine of higher ionic concentration. Urine specific gravity below 1.005 or above 1.025 is considered abnormal, which may indicate adulteration. Next, with the cup facing to you, observe the result. Negative: Each panel is a test for a specific drug. In this version, three of the panels test for two drugs at once. The other four panels test for one drug. The (C) line should be visible for all panels. The (T) or test lines will also be visible. Our experience suggests the lines on some panels may be fainter than others. This is perfectly normal. The rule is if there is a line no matter how faint, the result is negative. Positive: The (C) or control line will be visible for all panels. This tells you the test was successful. If an apparent line in the (T) or test line is missing the result is presumed positive. That sample should be sent to a laboratory to confirm your findings. The 10 panel urine drug test cup is designed for use on site or at home and will provide an accurate drug and specimen test result. Overall the king of all tests. Each box contains 25 individually foil sealed kits per box. 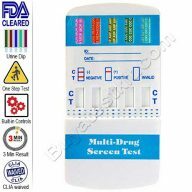 Full instructions are included in each box of 10 panel urine drug test cups. You can also download a test form and instructions on how to administer a test professionally. There is also a link to download the data sheet enclosed in each box.